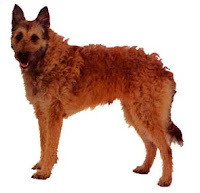 The Belgian Shepherd Laekenois is one of the four breeds of Belgian Shepherd dogs which may be listed as a variety of the Belgian Shepherd Dog rather than an individual breed. The other three breeds are the Tervuren, the Malinois, and the Groenendael. The Laekonois is the least common breed amongst the four and remains to be the only one amongst thses not recognized by AKC. It is rare in the United States but may be found in Britan, Canada, Australia and throughout Europe.